Vocalist Jan Shapiro is best known as an educational fixture at Berklee College of Music. She arrived at that venerable institution nearly three decades ago and she's shaped countless voices and careers in the intervening years, serving as teacher, role model and, for more than a decade, head of the vocal department in Berklee's Performance Division. Her focus on the future purveyors of the arts has occupied a great deal of her time over the years but, since the late '90s, she's managed to record and release a few albums that showcase her talent(s). 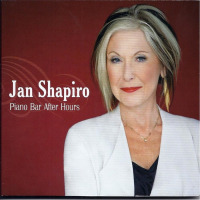 Piano Bar After Hours is Shapiro's fourth album to date and it finds her in the company of six different pianists, exploring a wide range of music. A quick glimpse at the playlist may make this one look like another run-of-the-mill standards/songbook session, but that's not exactly the case. Sure, Gershwin, Loesser, and Berlin are represented, but they aren't necessarily representative of Shapiro's tastes; she also shows a liking for the work of Kenny Rankin, Horace Silver, Jon Hendricks, Rickie Lee Jones, Al Jarreau, and Chick Corea along the way. Shapiro starts things off with "On A Slow Boat To China," which is actually pretty slow for a change. She infuses this song with a sense of longing that it usually never sees, immediately establishing herself as one who won't necessarily do the standard thing with the standards. Daniela Schachter does a fine job supporting Shapiro on this one, immediately making her mark from behind the piano. Things take a lighthearted turn with "You're Getting To Be A Habit With Me," which features Bob Winter on piano, and pure beauty wins out with "They Say It's Wonderful," which finds Tim Ray on the bench. Russell Hoffman steals the spotlight when he tickles the keys on a bluesy "Doodlin,'" but the fifth pianist to make an appearanceJohn Harrison IIIproves to be the most commanding. He brings a sense of surprise to Corea's "Time Lies," and delivers a solid solo on "If I Were A Bell," which also features some fine "ding dong" vocal improvisation from the woman in charge. Shapiro's flexible soprano, which glides along the clouds and flies gracefully on helium-dusted wings, becomes more affecting as the album plays on; the final trackJones' "Company"completely melts the heart. The only number that doesn't fit the bill is Jarreau's "Tell Me." It's hard to understand why Shapiro felt the need to break the intimacy spell by putting a keyboard-backed tune with multiple voices-as-instruments into the penultimate position in the program; it sounds a bit out of place and doesn't fit the formula of the album. By and large, Piano Bar After Hours proves to be a compelling listen. Shapiro's skills as singer, interpreter and storyteller are on display for all to hear; not just those lucky and talented enough to study with her. Track Listing: On A Slow Boat To China; You're Getting To Be A Habit With Me; I Keep On Loving You; They Say It's Wonderful; Doodlin'; Lost Up In Loving You; Times Lie; If I Were A Bell; Who Cares; Tell Me; Company. Personnel: Jan Shapiro: vocals; Daniela Schachter: piano (1, 3); Bob Winter: piano (2, 9); Tim Ray: piano (4, 11); Russell Hoffman: piano (5, 6); John Harrison III: piano (7, 8); Adriana Balic: keyboards (10); Bob Stoloff: vocal drums (10); Joey Blake: vocal bass (10).